Marvel fans have been anxiously waiting to hear what Sony was going to do about Venom&apos;s official rating, and now that answer is here. As many fans and industry analysts predicted, Venom will be given a PG-13 rating. Tickets for Venom are now on sale, and in order for that sale to take place, the movie&apos;s official rating and runtime has had to be revealed. So far (at the time of writing this), AMC Theaters has been the one to confirm the PG-13 rating and runtime of 1 hour and 52 minutes, but it shouldn&apos;t take long for that information to spread to other sites like Fandango, or the official Venom movie website. This should come as little surprise to most Marvel fans who have been following the "will they / won&apos;t they?" 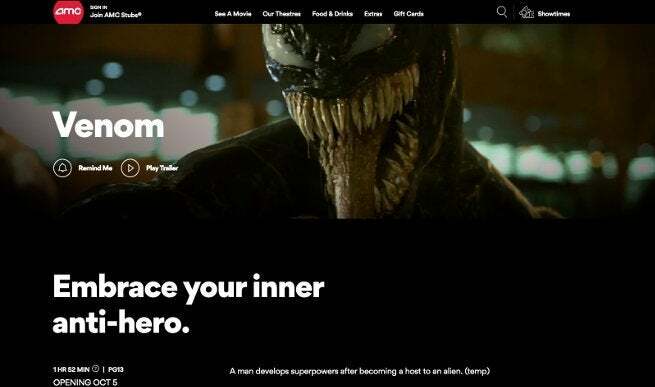 saga of this Venom movie rating. About a month ago, it was reported that Sony was leaning toward a PG-13 rating for Venom, mainly because the studio was worried that an R-rated version of the character would greatly hinder the movie franchise&apos;s potential of one day being able to crossover with other prominent Marvel movie properties — be it Tom Holland&apos;s Spider-Man movie franchise, or the larger Marvel Cinematic universe. Right now, Venom is an outlier that&apos;s not officially connected to the Marvel Spider-Man films or the MCU, so there&apos;s no doubt that Sony is hoping that big box office success could somehow help the character and his franchise &apos;buy their way into&apos; the MCU. A PG-13 rating would indeed allow a much wider audience to freely buy tickets to see the film — specifically those all-important teenage and young adult demographics. However, there is an other side to this equation that could potentially backfire on Sony, if fans feel that the movie version of Venom is not as dark and violent as some want him to be. Reports that Venom will be biting off heads of crooks and committing other violently gruesome acts had fans excited for a truly horrific Rated-R version of the film, and in the era of Deadpool, coming up short of that could be a bad business decision. And yet, as of now, box office tracking suggests that Sony is poised to have a record-breaking October opening, and with a PG-13 rating now confirmed, those projections are likely to increase. Director Ruben Fleishcer has also promised that no matter the rating, Venom will push the limits of violence, much in the same way The Dark Knight famously terrified moviegoers with a PG-13 version of The Joker. How do you feel about Venom being PG-13? Let us know in the comments! Venom is set for release on Oct. 5, 2018. Published on Thu, 13 Sep 2018 19:55:23 GMT, © All rights reserved by the publisher.